But there are also some difficulties home workers face, not all women have the motivation to be productive at home, or the ability to switch off in the evenings and weekends when their work in all around them. This is the first obstacle, do you physically have the space to do your work? Can you set up a workspace with everything you need, whether a permanent one or one you can set up on the kitchen table when you need to? You might only need a laptop to carry out your job, so that’s pretty easy to fit somewhere. But what about if you need to have other things to hand? Where can you store everything you need? With some creative use of furniture you can create yourself a nice looking workspace in a corner of your lounge or dining room. If you have the space it can be really useful to set up a home office in a specific room where you can shut the door and leave work behind. In the absence of a whole office to yourself, some people use spare bedrooms but you might want to consider converting a garage or shed into a home office too. It also means that it’s less easy for the family to disturb you with various requests! One of the key things that people say that they find difficult about working from home is the lack of motivation. With no boss breathing down your neck it can be a bit too tempting to eschew that report writing and curl up with a box set instead! However by setting yourself some clear guidelines you can make sure that you manage your motivation. Firstly write yourself a weekly to-do list that prioritises your workload for that week and set yourself specific deadlines for when you need to finish each task. Don’t let yourself get distracted until they are done! You should also give yourself rewards for achieving your work goals. Why not promise yourself a cup of tea with a friend or your favourite magazine at the end of the week to help motivate you? I try to keep Fridays work free, so if I get everything done I can have a free day. If I don’t stay motivated and on top of my tasks, then I end up having to use the Friday to catch up – my own fault! It can also be really valuable to outsource the business tasks that always suffer from your lack of motivation to a virtual assistant or business manager to help you prioritise your work. If there’s certain things you are always putting off, they can let you know what you need to do and remind you when you need to do it, or even do it for you. Finally, while it’s soooo comfy working in your pyjamas and what you wear doesn’t really affect your ability to do the job, it can affect your mindset and motivation. Your don’t have to put on a full suit every day, but at least get yourself presentable and get your ‘work head’ on. Lucky for me I have to get dressed to take my children to school before I start work, otherwise I too would sometimes be working in my lounge wear! The housework calling you because you haven’t vacuumed yet. Family or friends popping round or calling you for a chat because you are always ‘in’. Your teenagers needing you to help look for something or the dog wants to be let out. So many distractions while you are trying to get on with some work! To keep productive make sure you leave the chores and chats for when you are not in your ‘working hours’. The dog probably can’t help it (and he looks so cute!) but for everything else, make it clear when you are working and when you are available. Minimise distractions that you know are not helping, turn the telly off, maybe try some inspirational music instead. Some of my clients love the peace and quiet of working from home, but if you are a people person or an extrovert working from home could make you feel rather isolated or lonely. It can be a shock if you previously worked in an office. However there’s lots that you can do to make sure you keep in touch with the real world! Schedule regular face to face meetings or Skype calls with clients or prospects – they’ll be impressed that you are taking the time to contact them and you’ll enjoy the interaction. You could also consider joining a business networking group to meet others who run a business from home. There are all sorts available, I love to attend meetings aimed at mums or women in business, but you can also get industry specific groups and ones for businesses in a certain locations. You can choose informal drop-in meetings, or ones that you attend each week or month. Try some out and see what you feel comfortable with. As well as being a brilliant way to make great contacts for your company, it will encourage you to get out and about and you could end up making some good friends too – I certainly have from the groups I attend. Have a look to see if there are any co-working spaces where you can hot desk when you fancy a bit of interaction while you work, or a local Jelly where other local business owners join together and all work in the same space on a regular basis. These are ideal if you miss those water cooler moments for a quick chat from your days in an office environment. Social media doesn’t have to be a distraction, you can use it to take part in Twitter chats, and engage with groups on Facebook and LinkedIn (try to keep it business related, to feel productive!). You can also get some challenging or stimulating conversation going in the comments or responses to articles and blogs, if you really need to interact with another human being. When you work from home one thing that you need to do is to set both physical and metaphorical boundaries! You know that great feeling at the end of the working week when you turn off your computer and walk away from the office? Well when you work from home you’re in your office building 24/7 and it’s all too easy to never turn off! Before you know it you’re doing research at 1am or sending off a quote on a Sunday afternoon instead of relaxing. You should set some specific working hours for yourself. Although you need to be flexible when you have your own business you might set a target to never work beyond 7pm or you might have a dedicated family day at the weekend when you resist looking at your emails and checking our phone (yes, I know it’s hard!). Unless I’ve had an extra day off in the week and need to catch up, both weekend days are strictly non-working for me – 100% family time. Be clear with family and friends when you are free, and when you are working. Similarly with clients, ensure they know your working hours and don’t be tempted to respond to emails or other messages during your down time – it can give the impression that you are constantly available. You’ll find that if you set these boundaries you’ll feel far more in control and it won’t feel as though work has taken over your life. 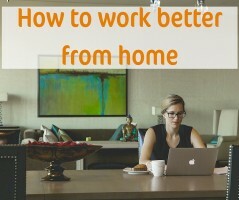 If you are struggling to run your business from home and want some advice on how to make it work better for you, get in touch and let’s work together to find out what you could do to make working from home work for you!